Walked Third Street over the weekend in Los Angeles. I was first turned on to Derringer by our friends over at Corduroy Magazine. Have walked by Derringer‘s showroom a bunch of times, but, they were always closed. 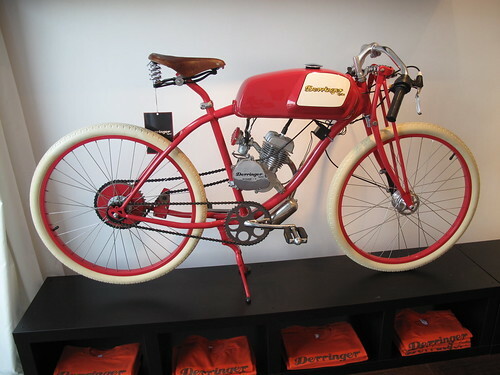 Finally, got to visit the Showroom-store on Saturday and learn a bit about these beautiful bike-mopeds. Thirty Five MPH, 180 MPG… one tank takes you a long way. Maintenance is similar to a bike and a general monthly lube of the engine. The engine I believe is plastic cased so that it doesn’t get hot and you won’t burn yourself…. unlike tons of scooters I’ve ridden. A really nice commuter and darn good looking. Oh man, I’d love to have this. Anyone have one? ?